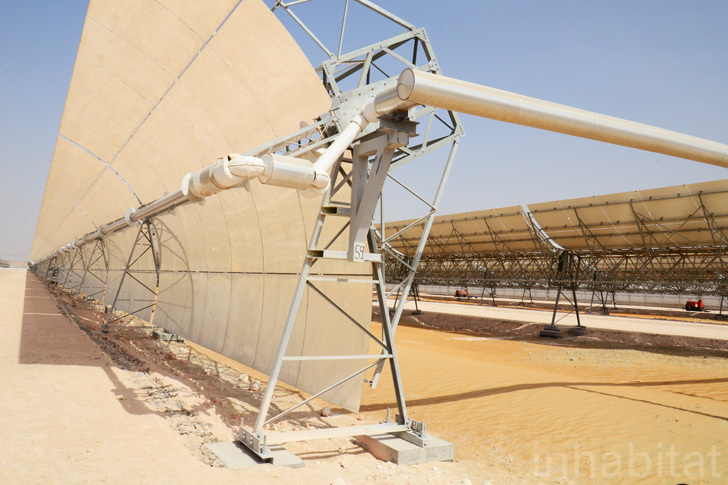 Shams 1, the world's largest single unit Concentrated Solar Power plant, is expected to come online within the first quarter of 2013 and we have exclusive images of the facilities. 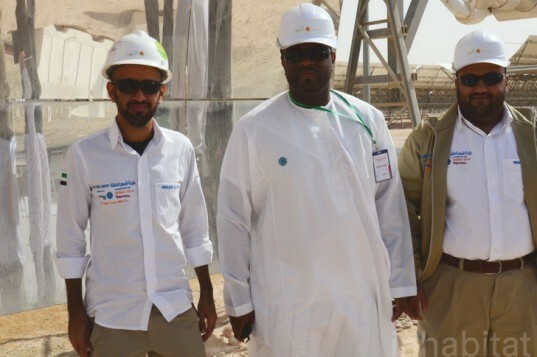 Snapped up on a recent tour sponsored by Masdar, these images depict a 100 MW parabolic trough plant that received funding from the United Nations under the Clean Development Mechanism (CDM). A partnership project between Abengoa Solar, Total and Masdar, Shams 1 is expected to reduce carbon emissions in Abu Dhabi by 175,000 tons per year, which is equivalent to taking 15,000 cars off the road. The parabolic trough collectors track the sun from morning to night and concentrate sunlight onto embedded tubes carrying a heat transfer fluid. This fluid, which consists of synthetic oil mostly, hits the system at roughly 300 degrees celsius. Once heated by the sun, the temperature rises to approximately 400 degrees before it is passed through a natural gas-powered booster that literally boosts the temperature by an additional 140 degrees, thereby substantially increasing efficiency. This heat is eventually used to boil water that generates steam that powers a conventional steam turbine. Located 120 km southwest of Abu Dhabi, Shams 1 was so situated in order to make use of existing energy infrastructure. Additionally it is close to natural gas production facilities, which made it easy to incorporate this fuel into the overall system. While the plant is not designed to run on natural gas, the plant will always run at 100MW capacity even if substantial cloud cover reduces the parabolic collectors’ productivity. The system is currently generating energy, but is not yet feeding energy into the national grid. We talked to Masdar’s Clean Energy Director Bader Saeed Al Lamki, who said at the time that the plant was launched, this technology seemed like the most reasonable option. Since then, the price of photovoltaic technology has decreased, he added, though he also notes that the best policy is to ensure an energy mix since there are trade offs to each technology. To illustrate this, he pointed out that Spain’s Gemasolar Power Plant, of which Masdar is a partner, runs around the clock due to storage facilities that PV technology can’t supply. A $6000 million investment, Shams 1 will contribute to Abu Dhabi’s overall goal to supply 7% of its energy with renewables by 2020. The Shams management team poses again!